Noticed some interesting patterns in the "signatures" this particular individual puts up for sale. Especially the placement of them. My guess is they use some kind of stamp/pen because none of the books actually looked like they've been signed via SK's own hand. 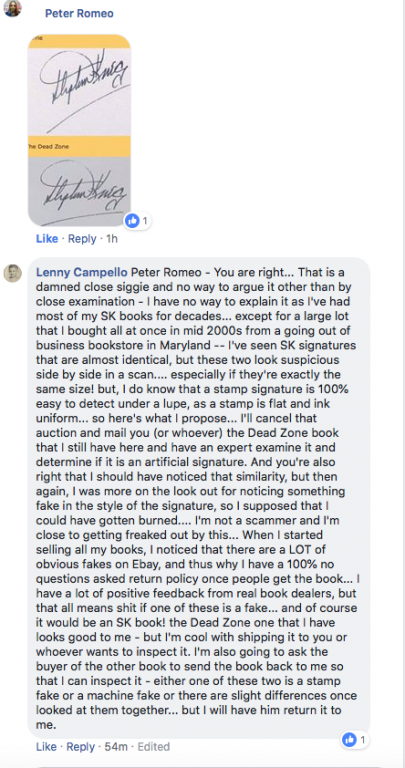 They have the appearance of an authentic signature, but notice the placement on all of the books up for sale or that have been sold. Maybe I'm overthinking this, but I'm highly suspect. Carrie and The Dead Zone are exactly the same signature. Either a stamp or an auto-pen. This person has been selling these stamped signatures for quite awhile.. assumed everyone knew about these. I’m guessing sorta maybe this individual made a rubber stamp imprint from a front board of one of the trade editions? Is there a better picture of The Green Mile? Not only forged, but used a black pen. 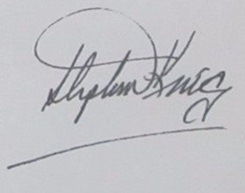 Every signature King did in London was done with a blue pen. Both are on ebay, the Green Mile one with a 50 pound starting bid. Same guy. He tricked me into buying one and i would love to get back at him. 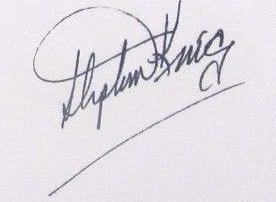 There is zero imprint from the signature. He was actually trying to sell a fake on a King group? Wow, he’s either telling the truth or he thinks King collectors are pretty stupid. He was selling an S/L in my group. I couldn’t call him out publicly cause it was definitely a signed limited. I did however Call him out privately as I didn’t want to go off on him unless it was a mistake. I would LOVE to here more from Cook and others here that have more ammo for me. He is an artist who has multiple blogs and has work out there and most scammers do it anonymously rather than jeopardize his career and what not. He is either VERY good at lying or he Is honest. I bought a book off him and he refunded me and said when it arrives look it over and ask the masses. I will be posting it here and on my group for thoughts and opinions. Doesn’t seem good though and at the same time... it does... again, could be the mark of an expert scammer. He even has a blog where part of it talks about fakes in the art world and how to watch for forgeries. Anyone else here ever deal with him? He is an artist who has multiple blogs and has work out there and most scammers do it anonymously rather than jeopardize his career and what not. Wow. He could be one of those “hide in plain sight” kind of scammers. Wish I could help but I’d never heard of him before this. Even my wife said "what the hell"? Seller took listing down, but yeah wow!! I am curious. What was the listing for? First edition - ? printing hardcover of IT. That's hands down the funniest attempt I have ever seen haha. The cursive isn't even correct... the s looks more like an uppercase cursive j. Been wondering about these... Glad I checked here!